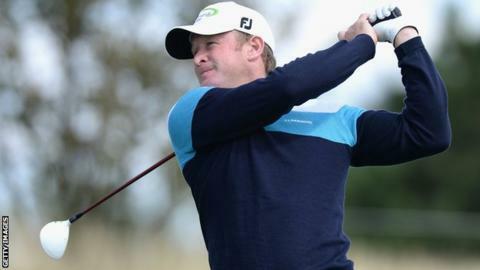 Welshman Jamie Donaldson continued his bid to win a Ryder Cup spot by staying top of the Czech Masters leaderboard. Donaldson leads on nine under after a three-under 69 and will seal a place in Europe's team to play the United States at Gleneagles with a win in Prague. "It's there but it's just another event where you're competing to play as well as you can and win the tournament," he said when asked about the Ryder Cup. France's Gregory Bourdy is eight under with five tied for third a shot back. Among them is another Ryder Cup hopeful Stephen Gallacher, who hit a five-under 67 to move into contention. The Scot admitted he was desperate to be part of September's biennial team event in his homeland. "It's the down time when you tend to think about it," he said. "When you fly into Edinburgh airport and there's a sign 100 foot by 100 foot and you live half an hour from it. You know it's there, you've been trying all year to get into it, so it's just a case of trying to do well the next two weeks and see it through." England's Lee Slattery, Tommy Fleetwood and Garrick Porteous are all level with Gallacher, whose round featured a run of five successive birdies. Fleetwood's seven-under 65 was the day's best round among the leaders while Gallacher and Porteous each carded 67, with Slattery going around in 69. Welshman Bradley Dredge is three off the lead after a two-under 70. Europe face the United States at Gleneagles from 26-28 September and will be looking to make it three straight victories over the Americans in the Ryder Cup, after a record comeback at Medinah in 2012 and the 2010 win at the Celtic Manor resort in Newport.